First, I'm back! Well, we'll see. Second, I'm embarking on an adventure in making over our master bedroom! I'm hoping that by putting this information out into the universe that it will cause this project to take center stage and actually get done! That's assuming that I've still got readers out there. I wouldn't blame you for leaving since I've not posted since October (shame!). I'm posting this from work and don't have access to all my pictures so this poor, sorry excuse for a photo from one of our first visits to the house before we closed will have to work as a visual. 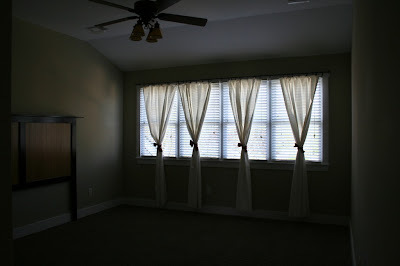 First, erase those awful "curtains" and remove the headboard from the photo. There! Now you've got our room sans furniture! The room boasts 9.5 foot ceilings, a sizable footprint and large bank of lovely windows that overlook our front yard. It's a great room. Plenty of space, plenty of canvas for my little hands. I have tried to paint the room twice now. Once, I painted the wall around the windows a lovely shade of red as an accent wall. Here's a more furniture-rich, lights-turned-on kind of photo for you. 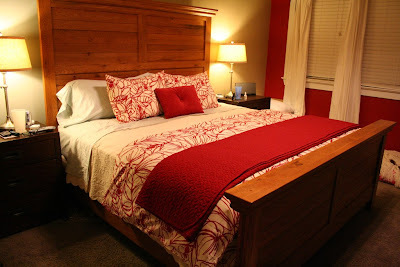 BUT, I'm a bedding whore and I've since switched my bedding out countless times and the red was really locking me into a color scheme. Currently, our bedroom is painted - in full - a shade of green that's lovely. But after 6 months of it though, it's growing tired. Due to the ceiling height and fact that there are 2 large, completely uninterrupted walls in our room, any color choice for the walls ends up being quite a committment. It's just SO. MUCH. of any shade. Even if it was a nice neutral beige! Cue the angels singing. Recently, I've been on a complete mental tear about "should we move? ", "what renovations/upgrades can we make....NOW? ", "why can't I make my master bedroom the haven I desire?" I've been a mess. But I'm constantly inspired by my fave bloggers over at Young House Love and their "make things look easy" way about them has prompted me to strive to put up ..... WAINSCOTING..... in our master bedroom! 1. Get rid of GIANT bed and replace with Farmhouse Bed from Pottery Barn. 2. Use MDF to create faux wainscoting a la Thrify Decor Chick. 3. I plan on painting the wainscoting either white or some shade thereof. Then the walls - possibly a grey. I'm undecided at this point. I want to start this project ASAP, but as usual, the first weeked after my brilliant idea is chocked full of activities and I doubt we'll be able to do more than plan and perhaps buy and have cut the MDF. Stay tuned! I promise to post this project in all its glorius phases! Can't wait to see it!! We are doing all the trim on our new house - let me know how wainscoting goes! !